The Cape honey bee (Apis mellifera capensis) is a subspecies of the European honey bee (Apis mellifera) and is native to the Eastern and Western Cape provinces of South Africa. In its natural environment (the Fynbos region of South Africa), the Cape honey bee can be readily managed for the purposes of honey production and pollination, just like other races and strains of the European honey bee. However, the Cape honey bee has a distinct reproductive system which makes it unique amongst other races of Apis species. 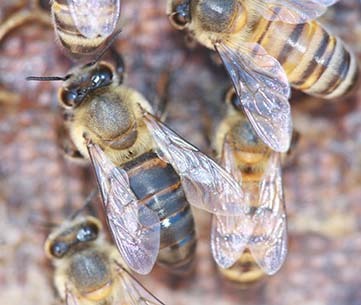 This unique reproductive system causes major problems for beekeepers in its natural environment of South Africa where it acts as a ‘social parasite’. Cape honey bees swarm and abscond much more frequently than other races of European honey bees. Typical European honey bee colonies will swarm once every 12 months, while Cape honey bees are capable of swarming every month or two. Cape honey bees are more ‘flighty’ than European honey bees and commonly leave the hive when it is being inspected. Cape honey bee colonies grow faster and tend to be smaller than European honey bees. Cape honey bees also store less honey than European honey bees. Unlike the closely related African honey bee, the Cape honey bee is quite docile. For the majority of their life, Cape honey bees follow the same life cycle and biology as European honey bees and other Apis species. However, it is the reproductive ability of the Cape honey bee and its tag of ‘social parasite’ which differentiates this bee from all other Apis species. In a typical European honey bee colony, the simplified reproduction steps outlined below occur. When a queen bee lays an egg, she can control whether the egg is fertilised or not fertilised. If she lays a fertilised egg, this egg will become a worker bee or queen bee (both female). If she lays an unfertilised egg, this egg will become a drone (a male bee). This type of reproduction is called haplo-diploid because the queen bee can lay either unfertilised male eggs (haploid) or fertilised female eggs (diploid). Worker bees also have ovaries but they are unable to mate. However, worker bees are still able to lay eggs, but since their eggs cannot be fertilised then worker bee eggs can only become drone bees. 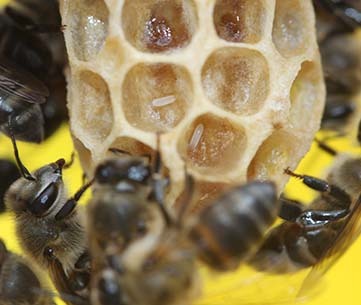 The presence of a healthy and laying queen in a colony suppresses egg laying by worker bees. 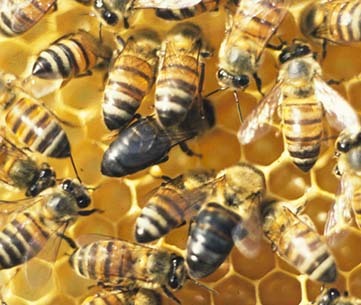 In a European honey bee colony, the queen may die for a variety of reasons. To counter the loss of the queen, workers may begin to nurture a young larva that was laid by the now deceased queen, and hopefully raise her as a replacement queen by feeding her royal jelly. However, this sometimes is not able to happen and the colony is not able to re-queen itself, and then collapses. 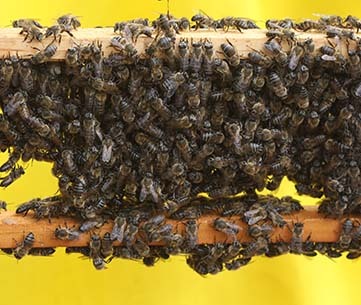 Before the colony perishes, and without the queen to restrict laying worker bees, worker bees begin to lay haploid offspring which become drones. These drones are viable and act as the last chance for the colony to pass on its genes. 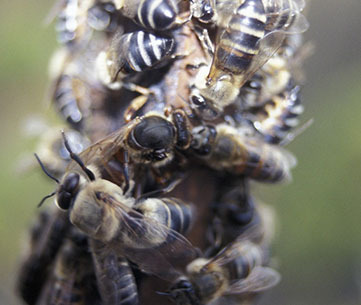 The Cape honey bee reproductive cycle is unique among Apis species because a high proportion of unmated worker bees can lay eggs that develop into either worker bees or queen bees via thelytokous parthenogenesis. Therefore, when a Cape honey bee colony becomes queen-less, some worker bees’ ovaries will develop and the worker will begin to lay eggs. Unlike colonies of European honey bees where worker bees are only able to lay unfertilised diploid (male) eggs, Cape honey bee workers are capable of laying unfertilised diploid eggs which can develop into a worker bee or a queen bee. This can occur even without the Cape honey bee mating. 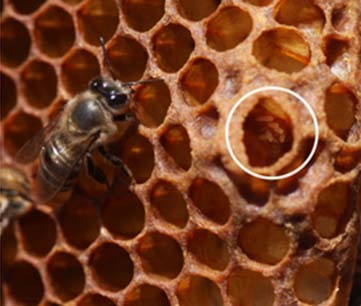 Worker-laid Cape honey bee eggs yielding females, instead of actually being fertilised, have their diploidy restored during a modified meiosis II. The offspring from a laying Cape honey bee worker is therefore a type of clone, genetically identical to their mother. 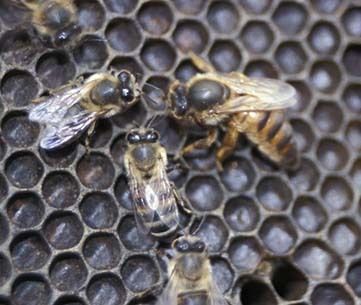 Although the ability of worker bees to lay unfertilised diploid eggs which can still develop into worker bees or queen bees sounds harmless, it is the interaction between Cape honey bee colonies and African honey bee colonies in South Africa, and their unique reproductive system that is cause for great concern amongst beekeepers. In the mid 1990s beekeepers transported Cape honey bee colonies into the northern regions of South Africa where they do not naturally occur. Apart from a naturally occurring hybrid zone between the African and Cape honey bee populations, these bees never interacted completely. However, since the Cape honey bees have been moved by beekeepers into areas where African honey bees naturally occur, the Cape honey bee has started to socially parasitise African honey bee colonies. The increased distribution of the Cape honey bee has therefore allowed for clonal lineages of Cape worker bees to establish, which have become widespread as reproductive (social) parasites within African honey bee populations. This has occurred because the Cape honey bee can easily drift into colonies of other honey bees, such as African honey bees and can parasitise that colony. When this occurs, the queen from the host colony is lost (a process that is still not yet understood) and the Cape honey bees become the reproductive individuals in the colony. This is achieved because the Cape honey bees are capable of changing their pheromone from a worker, to a queen-like scent, which means that parasitic workers can lay diploid eggs and get the host colony to raise and care for the eggs without knowing. Although the host colony has lost their queen, the Cape honey bee assumes this role without the host colony rearing a new queen. As a result, the Cape honey bee workers increase in number in the host colony, while the numbers from the host colony slowly dwindle, which subsequently leads to the collapse of the colony and the Cape honey bees seeking a new host colony. Cape honey bees present a major problem for beekeepers in South Africa, and could pose a major problem to other beekeepers around the world if they were to spread to other regions. The ability of Cape honey bees to drift and parasitise other honey bee colonies, causing these colonies to dwindle or die is of great concern. It is perceived as such a threat in South Africa that local beekeepers believe that Cape honey bees pose a greater threat to beekeeping than even the deadly Varroa mites. The Cape honey is only present in South Africa. The Cape honey bee is not present in Australia and there are strict quarantine requirements in place to protect the Australian honey bee industry. If you think you have seen Cape honey bees, call your local department of agriculture or the exotic plant pest hotline on 1800 084 881.